Cushion Foil is the Cadillac of food wraps. This two-part insulated food service sheet will exceed all your expectations when it comes to heat retention and ability to hold a folded crease. You can’t go wrong with this foil wrapping paper. 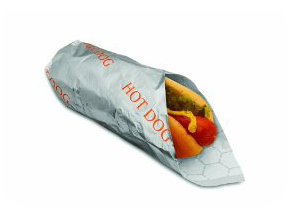 Cushion foil is great for wrapping hot dogs and hamburgers. It will keep wrapped food warm and moist in a warming drawer or under a heating lamp for an extended period of time. This heavyweight sheet can take your branding image to the next level! What is the minimum order requirement for custom printed Cushion Foil? What is the lead time for custom printed Cushion Foil paper orders? Standard lead times for all custom printed Cushion Foil orders is 6-8 weeks. Rush orders are available for an additional fee when the production schedule allows. Transit time is typically 2-4 days for the East coast and 5-7 days for the West coast. How do I decide between standard sheet size versus custom sheet size for Cushion Foil? 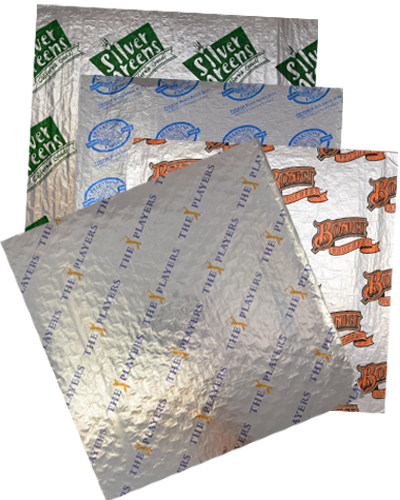 Cushion Foil paper sheets are available in a standard list of sheet sizes that will help keep your overall project cost down. Cushion Foil can be printed with up to 3 spot PMS colors. Our design team will review your art file and determine what colors are able to be printed. We can match any PMS color on the chart. Need a price quote on custom printed Cushion Foil? Contact us today! Looking for an eco-friendly alternative to cushion foil? Check out our Industry Exclusive custom printed Hot Paper sheet. Hot Paper is microwave and oven safe with no delaminating. Three case minimum for custom printed orders.